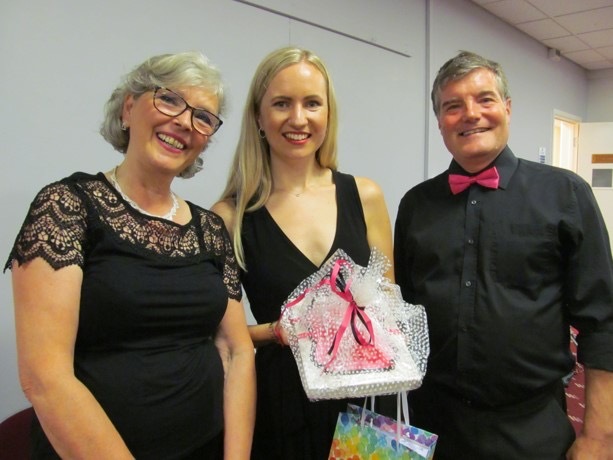 Tina Gelnere musical director of Uckfield Singers for the past three years is presented with leaving gifts by Quinta Dean and Nick Poole. Tina Gelnere, musical director of the Uckfield Singers for three years, directed her last concert for them on Saturday. She went out on a high with the concert well attended and showcasing a wide variety of songs. Tina is due to start a masters degree in operatic performance at Cardiff University in September. Choir members say she will be badly missed but she is going with all their good wishes. Saturday’s concert was held at Uckfield Civic Centre and raffle proceeds were added to a donation from the choir enabling a £500 cheque to be presented to Wendy Pengelly, of the charity Headway East Sussex based in Newick, by choir chairman Nick Poole.